Happy Tuesday y’all! 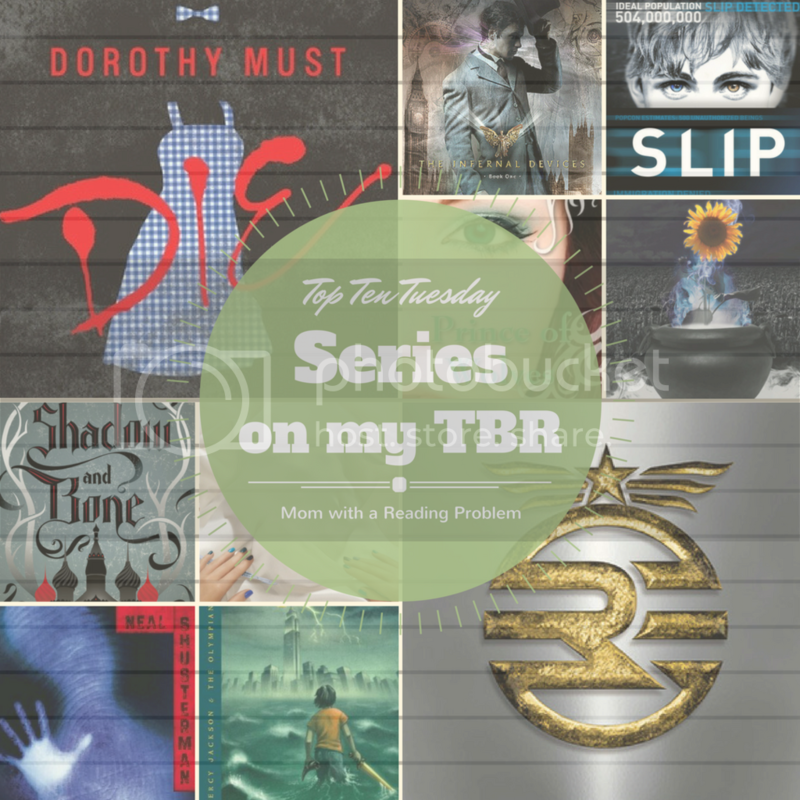 This week’s topic is “Top Ten Series I’ve Been Meaning To Start But Haven’t.” My TBR list is a mile long and so many of the books on there are the first in a series. There are multiple series on my TBR list that I need/want to read. But between life, blogging, and my unending TBR I haven’t had time. Here are the top ten series on my TBR that I need to start ASAP. As always, these are in no particular order, covers link to Goodreads/Amazon (aff)/Blog. Percy Jackson and the Olympians by Rick Riordan: This series has been on my radar a long time. When I was working at a pediatric hospital, one of my patients and I bonded over our shared love or reading. He insisted I read this series and I went out and bought it. However I never got around to reading them. I really should read them, I love urban mythology! Unwind Dystology by Neal Shusterman: I’m a sucker for a good dystopian and I found this series for a steal on Bookoutlet.com a few years ago. I spent less than $5 for the entire series in hardback. Now I just need to make time to read it. The Infernal Devices by Cassandra Clare: Honestly I want to read this series more than The Mortal Instruments. It’s a prequel series and I’ve been told it has a bit of a steampunk element to it, plus it’s set in Victorian England. I’ve put off reading it until I finish TMI, which will hopefully be soon. Salem’s Revenge and Slip by David Estes: I love this indie author! I’ve read his Dwellers Saga and fell in love with the writing style. Now I need to read his other series: one a fantasy with witches and the other a dystopia. Legend by Marie Lu: I fell in love with Lu’s writing reading The Young Elites, now I desperately need to read her dystopian series. It’s at the top of my TBR….as soon as I get my hands on a copy. Dorothy Must Die by Danielle Paige: When I first started blogging three years ago, I wasn’t a huge fan of retellings. That has changed thanks to Marissa Meyer and A.G. Howard. The Wizard of Oz is one of my all-time favorite series. I’ve even read them to my son and he enjoys them. SO I’m curious to see how this series plays out. I just got a copy and I’m itching to dive in. The Grey Wolves by Quinn Loftis: I’m a huge indie reader and this series has been on my radar a long time. I even have the first few books on my Kindle. I just need to make time and read it. OOh nice ones! I still need to finish up the Dorothy Must Die series! I like them, but it does still seem like the first book is best. Then again, I’ve only read 2/4 books! Also really liked The Grisha Trilogy and the Legend trilogy! Great picks! Hope you get to read some of these soon! I have the first few Grey Wolves too I think! And I also haven’t gotten to them. 😛 And Book Outlet is evil…I rue the day someone introduced me to it. Haha! Yes!!! I introduced my husband to it last week and we wound up with another 16 books ? I thought Uglies was ok but I really hated Pretties! Didn’t get into Legend and Unwind was ok but I thought it could have been so much more. I really enjoyed the action and mythology and humour in Percy Jackson but the childish tantrums of the MCs soon put me off, which is a pity as there was plenty to like in them. I liked The Moon Dwellers but haven’t much liked his other series so far. Hope you get to start some of them! TID and Legend are two of my faves. I have read quite a few Percy books, because my co-blogger loves them, and I think it’s cool the way Percy grows up with Riordan’s own son. My co-blogger has been trying to get me to read The Grisha books too. It may be more of possibility since I loved SoC so much. I gave up on Dorothy. It may be too angsty for me. I have a feeling I will enjoy TID more than TMI. I like the time period it is set in and have a tendency to read books set during that time. That’s awesome about the Percy books. I didn’t realize that. That’s one of the things I liked about HP too is how the characters and novels grew. Unwind and Percy Jackson are both great series, I hope you enjoy them! Uglies is decent, but the first book in the series is way better than the rest of them. I also need to read The Grisha Trilogy and The Dorothy Must Die series. I’ve heard that from several people about the Uglies. It’s one of the reasons I’m hesitant to start.